The Energy Don's Blog: Is 85 the new 35? When it comes to setting targets, is 85 years the new 35? I'm not talking about some strange fitness plan for keeping elders as sprightly as youth, but instead looking far (?) into the future at climate targets for the years 2050 and 2100. Those of us who follow the climate debate are well aware of targets - often expressed as a percentage of 1990 emissions. Now it would be nice to believe that they choose 1990 as being the year that I started work in the sector, but it's really just a convenient baseline, roughly matching the break up of the Soviet empire and a couple of years before the seminal Earth Summit in Rio. So we have ended up with an abacus of number - 20% improvements in energy efficiency by 2020, 30% cuts in CO2, the main gas causing climate change, by 2030 and 80% cuts by 2050. So just when you are wondering whether we will meet any of those targets, here's a new one: full decarbonisation by 2100. Suddenly the goalposts have moved from 35 years to 85. Is 85 the new 35 - and does it matter? It's worth asking where these numbers have come from. Are they carefully though out by scientists, or are they a cynical attempt by climate change deniers to push the time horizon so far out that no-one has to take any action. Or are they a realistic long-term goal to overlay onto the other targets that we know (and perhaps love)? Well they are from an impeachable if not impeccable source: Chancellor Merkel of Germany and President Hollande of France. "The benchmark is the two-degree ceiling on global warming. The impacts of climate change will only be controllable to any degree if we manage to keep global temperature rise down to no more than 2° Celsius as compared to the pre-industrial period"
Merkel explained. French President François Hollande, who will be hosting the Paris conference marking 20 years from Kyoto on climate change this autumn, stressed that the national emission reduction targets announced so far fall well short of what is needed to keep global warming under the two-degree ceiling and noted that so far only 40 of the 194 countries planned to attend have published targets. 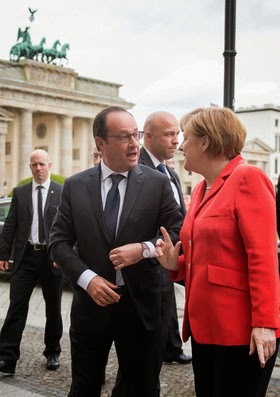 Merkel and Hollande jointly called on the international community to completely renounce the use of oil, gas and coal over by 2100. "All energy needs should be met using renewable sources. We must decarbonise our economies in the 21st century,"
So will it happen, or will the cynics be proved right? I am hopeful that it can, and believe that it is quite helpful to have a very long term goal - not least to give us a point against which to recalibrate if we slip, as I fear we inevitably will, on some of the intermediate ones. And is it achievable? With political will - which must include the USA, China, Russia and key developing countries as well as Britain and other EU countries - yes. 85 years is still a long way away, although young children alive today in developed countries will probably live to see it. If we reflect back 85 years, it takes us to 1930 - and the energy systems then were even more depdendent on fossil fuels than today, with coal the principal source. The age of oil was only just beginning, with fewer than 10% of the number of cars on the roads globally than we have today, and natural gas was just a nuisance to be flared off beside oil. Nuclear power was a remote theoretical possibility, with solar electricity also in the realms of science fiction. True there was some hydro (and biomass), but diesel was seen as a new and innovative fuel - at least in Europe with the Americans wedded to gasoline for their burgeoning vehicle fleet. 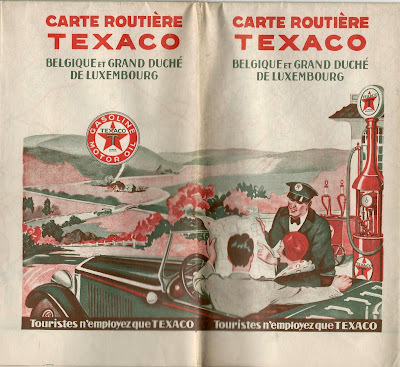 (That's a 1930 map of Belgium showing the latest in petrol station design!) So I don't think we should look at energy sources today and say that it's not possible to decarbonise fully in the next 85 years - and that's even without moderating demand through improving energy efficiency.